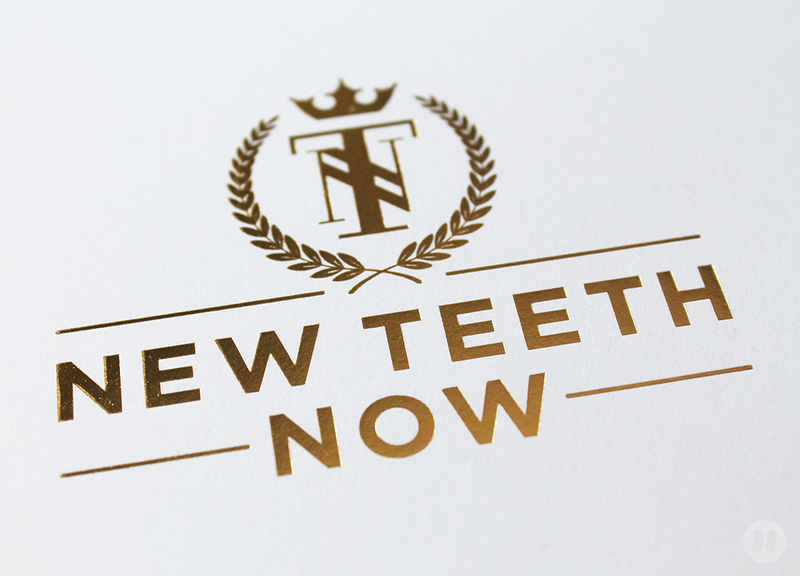 New Teeth Now is a world-renowned destination for oral surgery. 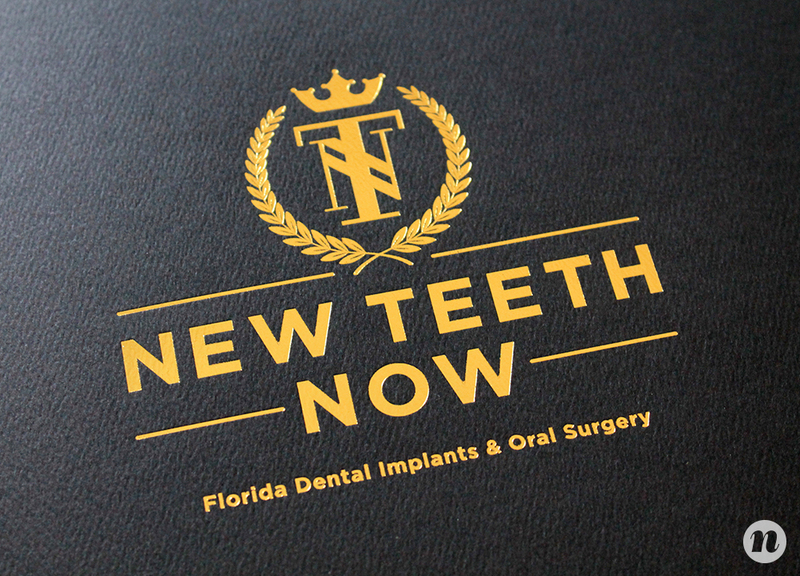 Located within Florida Dental Implants and Oral Surgery, New Teeth Now provides full mouth dental implants to improve the lives of their patients. 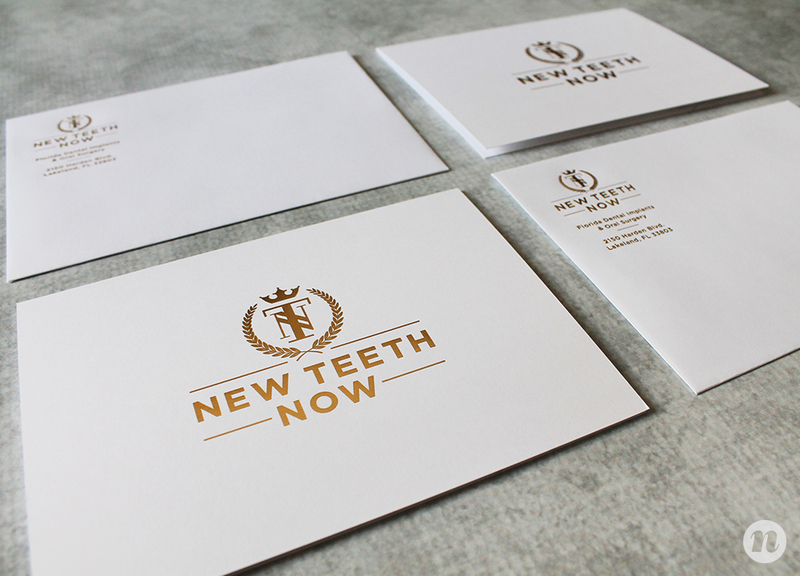 Our clients at New Teeth Now approached us looking for a logo. 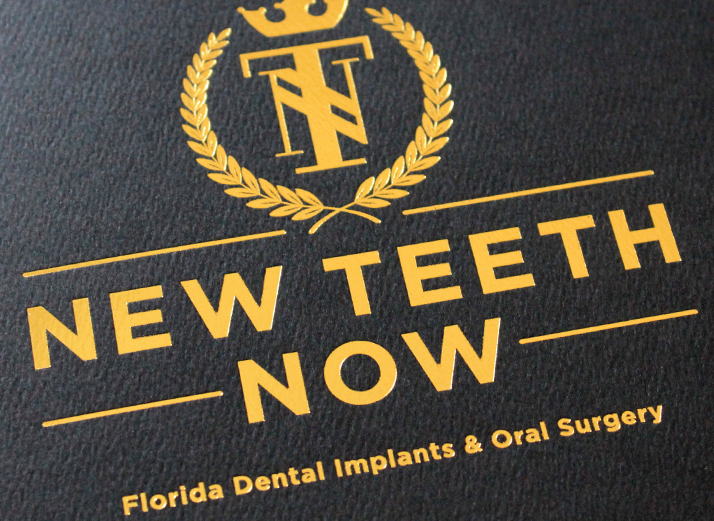 At the time, they were operating under the Florida Dental Implants brand and needed to distinguish themselves to showcase the unique value of New Teeth Now. We started the project with logo development. Our clients were pretty specific with their requests for the logo. They were adamantly against any inclusion of icons that represented teeth or implants. Instead, they wanted to project an image of luxury and class. 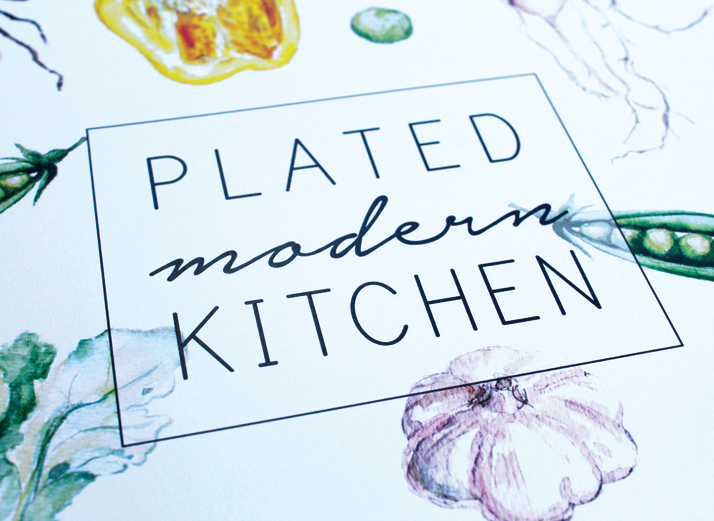 They were truly inspired by the world-class service provided by The Ritz Carlton, and they wanted their brand to align with that of The Ritz. Our team created several options, with one option featuring a crest of sorts. We also presented options that included a tree with handcrafted branches — 32 branches exactly. These represented the 32 teeth in the human mouth, while the blossoming tree indicated the life that comes from a healthy mouth. Additionally, we showed a custom created icon that formed the shape of a butterfly to indicate the regenerative nature of New Teeth Now. The wings of the butterfly loosely represented teeth, although we kept the correlation somewhat abstract to adhere to the directives provided by the client at the inception of the project. In the end, the crest-inspired logo was selected, and we perfected the design. 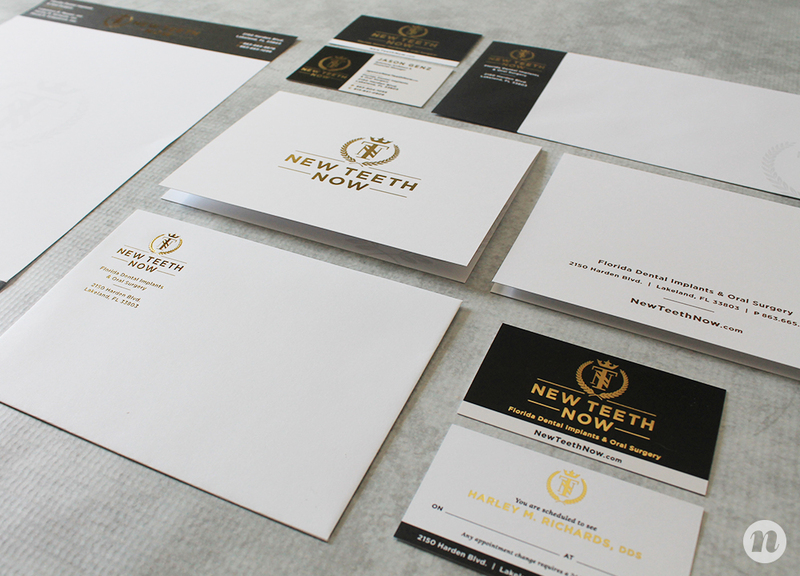 We chose a color palette that featured the logo in gold foil, placed on a luxurious matte black background or a clean white background. We provided the client with logo files in color, black and white, in various file types. 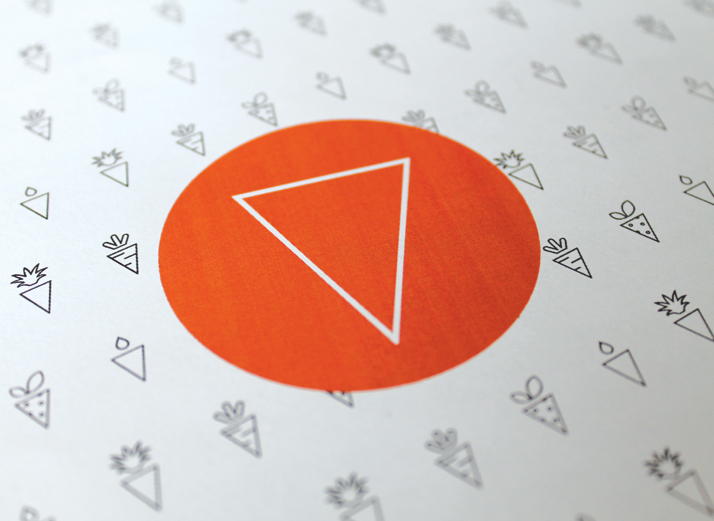 When the logo was finalized, we moved forward to update all existing materials with the new brand mark. 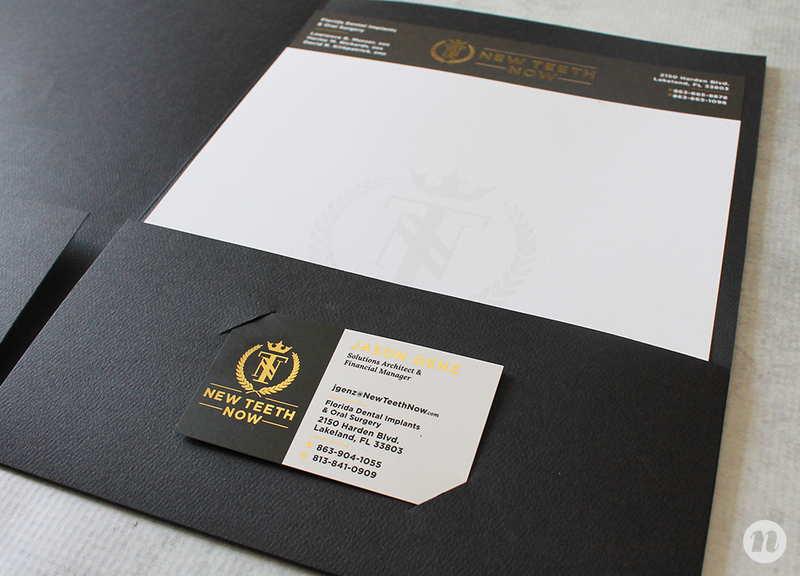 We created a suite of stationery that included business cards, letterheads, envelopes, and a note card. 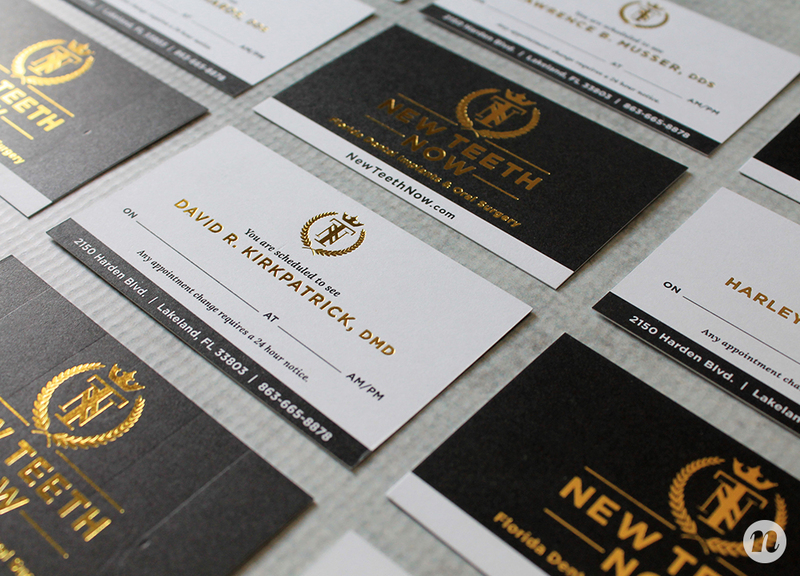 The business cards were developed utilizing the gold foil initially indicated during the logo development process. The logo was set on a black background, and we used blocks of white to showcase key information. 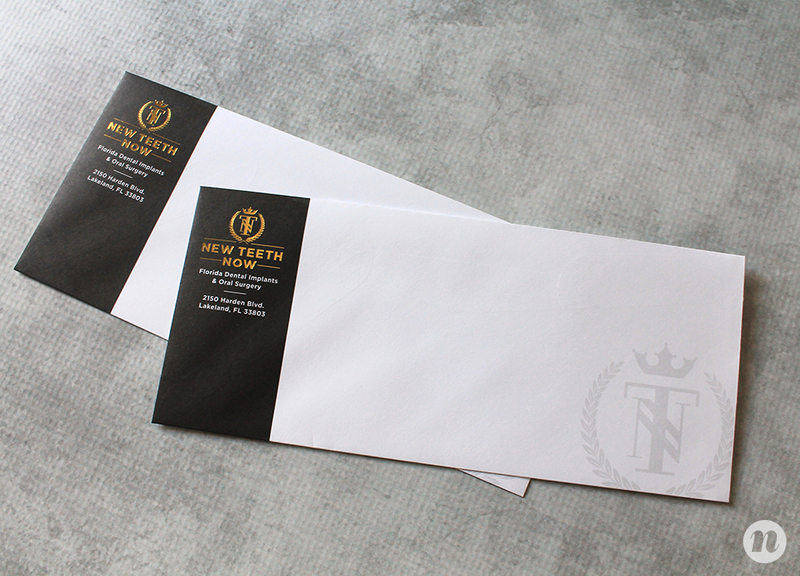 We printed the cards on a silk stock to align with the luxurious feel of the brand. 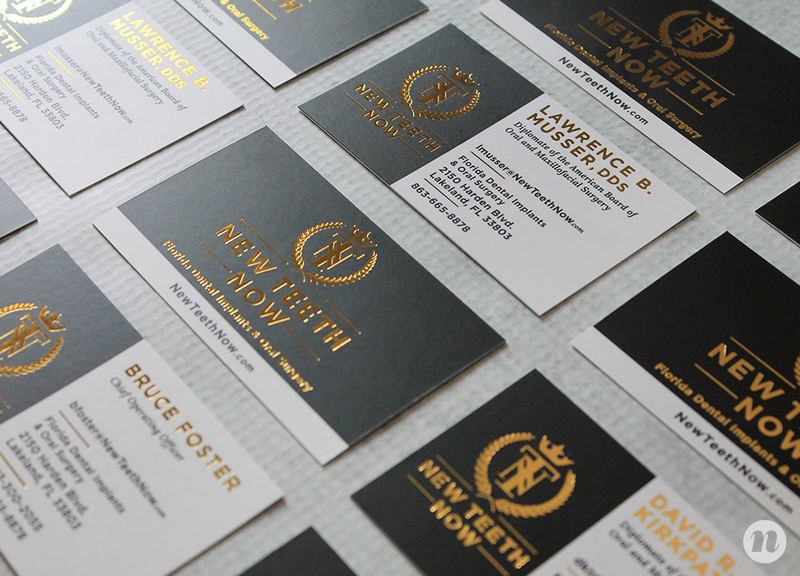 Our team considers business cards to be a key element of the brand. We create cards that set our clients apart and strive to stay out of the recycling bin. 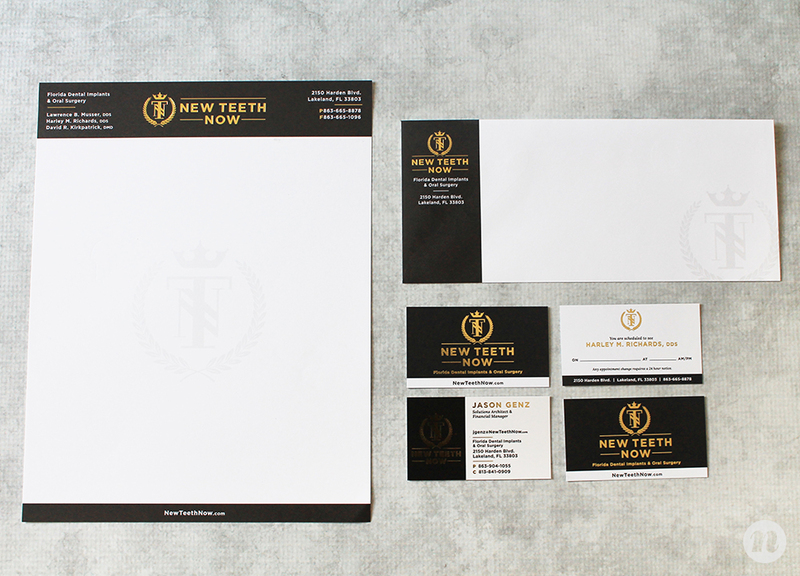 Letterhead and envelopes were created and printed using gold foil as well, and we also designed a letterhead that could be used electronically by the New Teeth Now team. 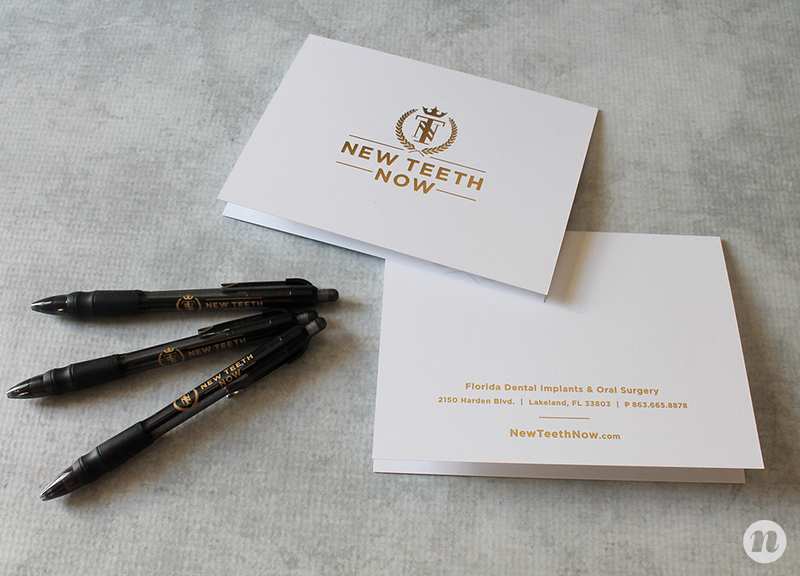 In addition to creating general stationery items, we also addressed their patient consultation package. 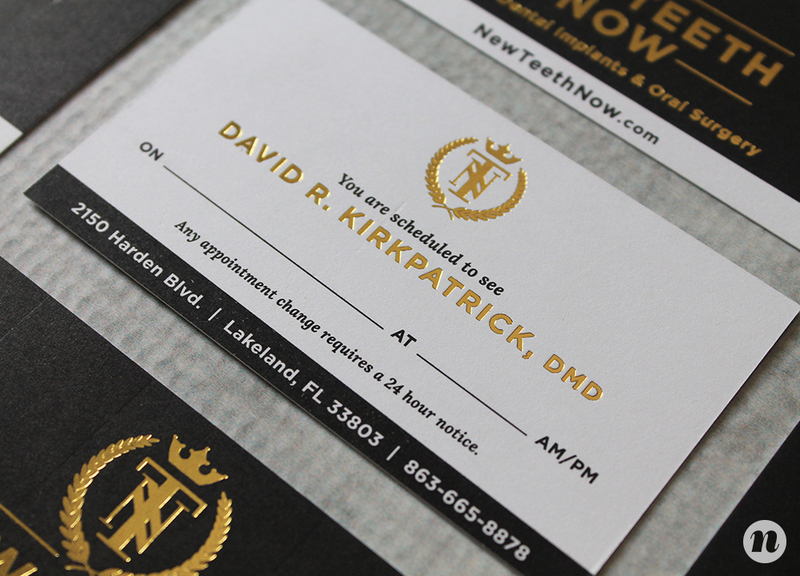 We worked through all patient-facing forms to not only bring in the new brand, but also to address user experience. We sorted through the information and improved the layout to create a more aesthetically appealing packet and to make it simpler for patients to complete the forms. 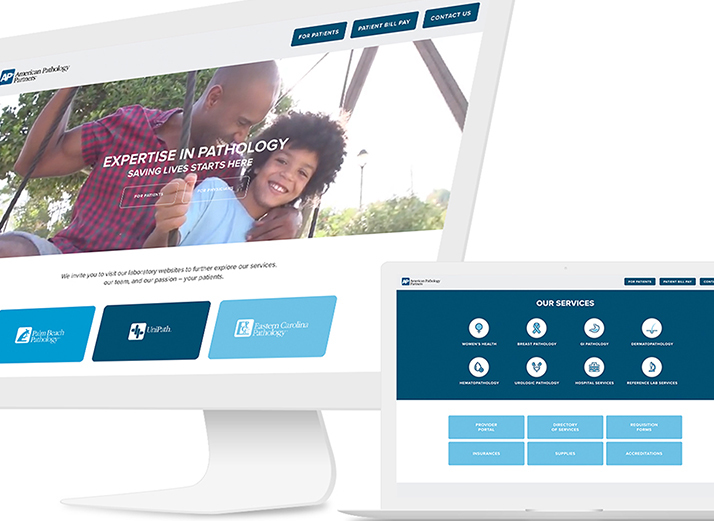 Our clients used their existing web company to extend the new brand to their new website, however, the result was a site with poor user experience and mobile design. The new site included elements that were not responsive on all screen sizes, and as we all know — that’s not ideal. We completed a website audit on the new site and proposed a litany of changes to bring the site up to par. In the end, our clients decided to have us rebuild the site to provide a better representation of their brand. We started with a set of wireframes that provided a skeleton of the site, prior to including any design elements. We worked through user-experience and navigation to provide a clean and intuitive customer journey that led users directly to well-placed calls to action. 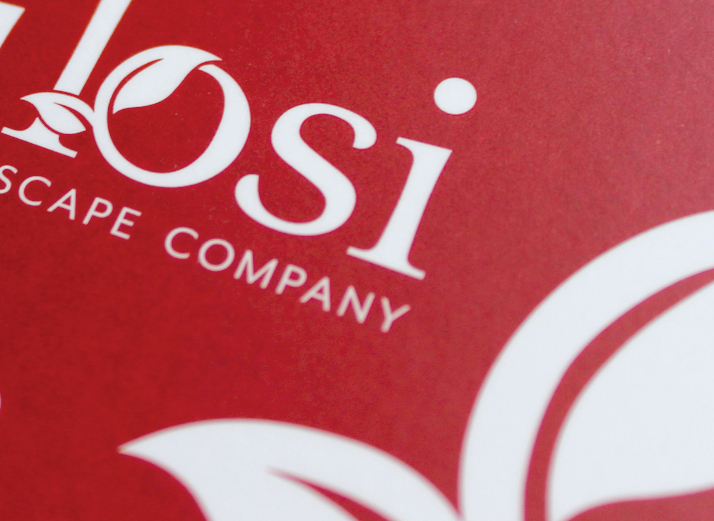 We then moved into design and implemented the brand we had created. We used the black, gold and white color scheme, and selected imagery that would compel users to identify with the brand and to feel a sense of ease as they scrolled through the site. Ultimately, we designed from a mobile-first perspective, ensuring that the site would look stellar on various screen sizes, specifically that of a mobile phone. 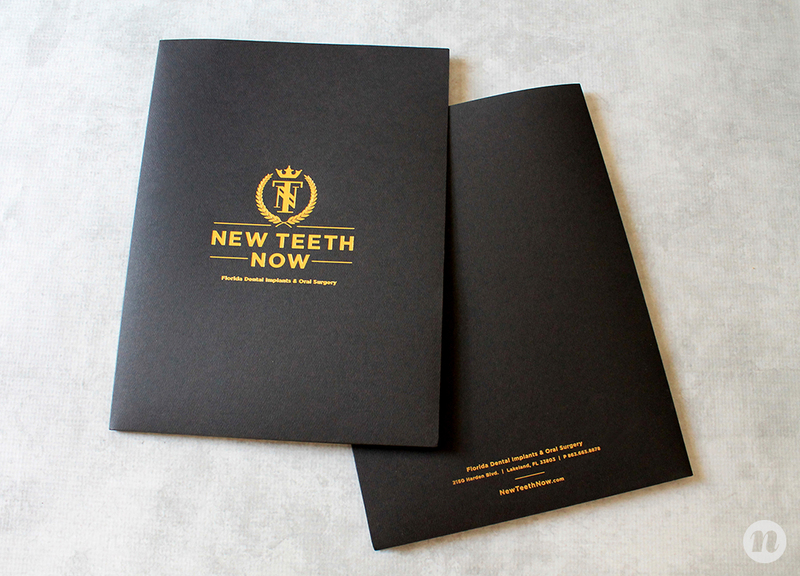 New Teeth Now had been working with a social media company that was garnering engagements but wasn’t accurately conveying the high-end nature of the brand. Most of the social posts were generic ‘dental’ themed posts that featured images of a toothbrush and common knowledge about the benefits of brushing. This strategy, while able to gain likes on the post, is not beneficial in terms of setting your brand up as a thought leader, or obtaining quality engagement. We took over social media management for New Teeth Now to elevate the brand and provide value through the content we were providing. We created theme buckets that included facts about the New Teeth Now procedure, video testimonials from patients, facts about the danger of periodontal disease to the overall health of the body, and more. We improved engagement month over month through the management of organic social content and paid social advertising. 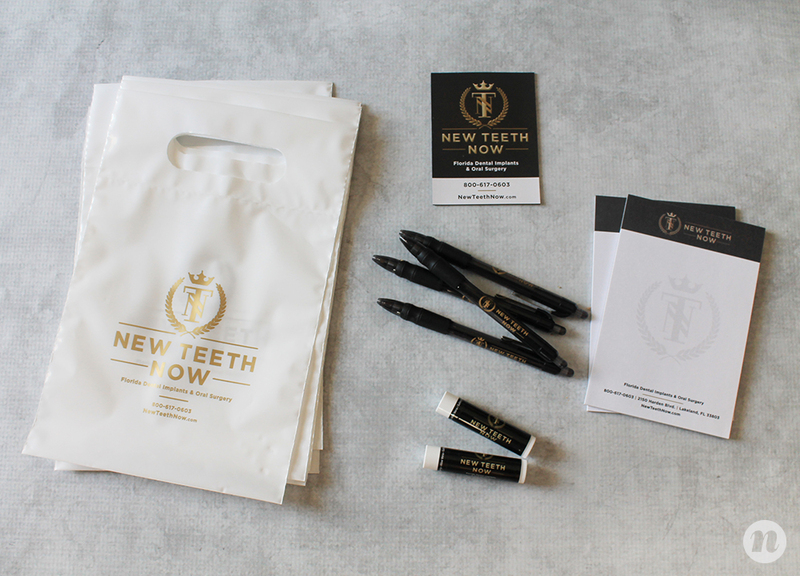 Finally, we supplied New Teeth Now with branded products ranging from super-soft bathrobes for patients, to high-quality ink pens, plastic and reusable bags, sticky notes, mouse pads, and more. Branded products can serve to either elevate or disintegrate your brand. Our team works within the brand look and feel established to propose and create branded products that align with the overall mission of your organization, are useful to the people who receive them, and are of a certain quality caliber. 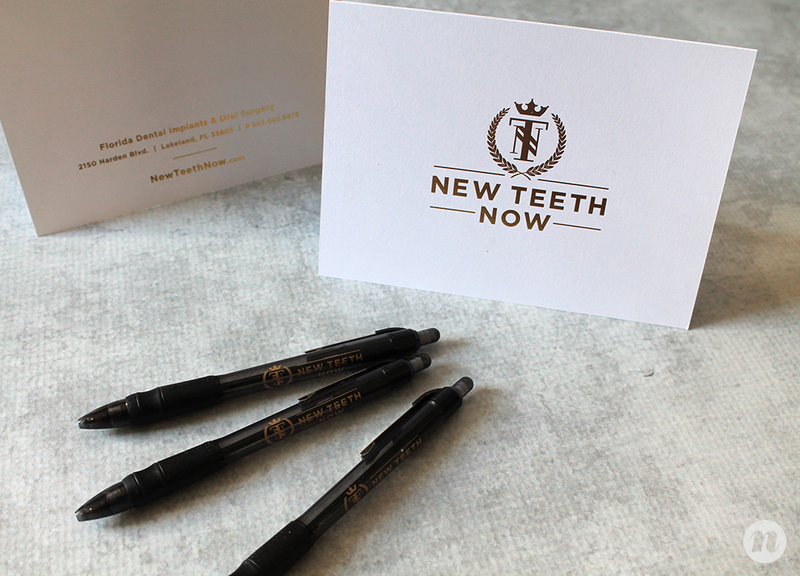 Overall the New Teeth Now branding project was a success. 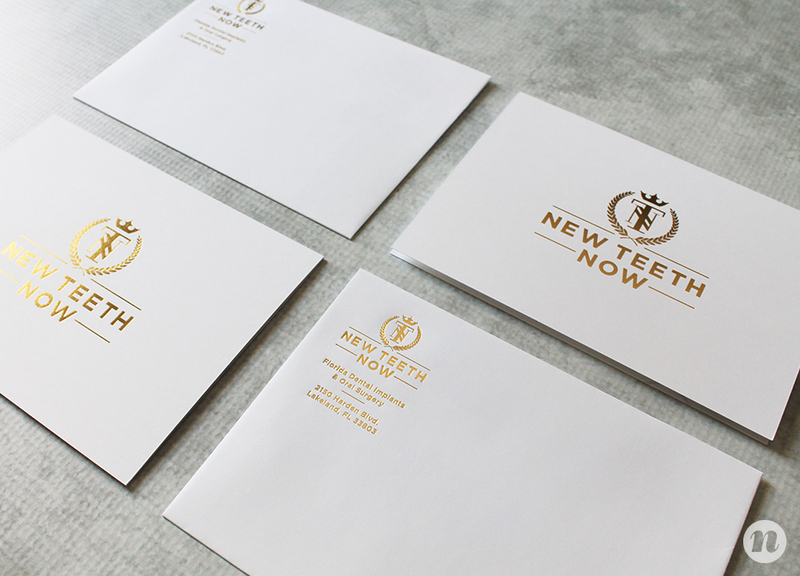 Over the course of time, we were able to touch almost every patient-facing piece of collateral to provide our client with a brand that better reflected their level of care. If you’re considering a rebrand, reach out to the Nice Girls. 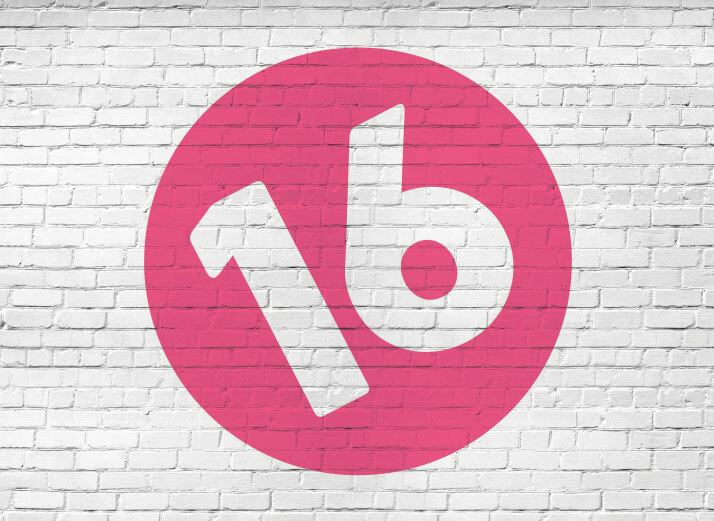 We’ve been down this road before and we can provide the expert insight you need to nail your new brand.